Thankyou for your prompt attention. The item arrived today 4.00pm approx - most impressive as I ordered it after your stated next day delivery cut-off. I have my new HDD up and running and backing up as I type I was so worried my old HDD would fail and I would lose all my data before I could back up, but not now. My sincere thanks once again for your data saving promptness. 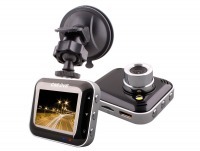 High-def recording of what happens when you're on the road with this great value dash cam! Maybe it's just me, but I see all kinds of crazy things when I'm out driving - and I've been involved in a few scrapes, too! Establishing who is at-fault when it comes to accidents on the road can easily degenerate into a "your word against theirs" stand-off. But simply installing an in-car dash cam like this great little HD unit can give you a solid defense against bad drivers, false claims and even an improperly configured speed trap! Running off your car's accessory socket, this compact HD camera records a 1280x720 image whenever your car's ignition is on using the Auto On/Off feature. Additionally, the built in Shock and Motion Sensors allow for recording that can be triggered for special events when G-forces exceed those typically felt under normal conditions (should anyone give your car an unwanted 'bump'). Generally you'd use the included suction cup mount to point one of these cameras at the road in front of you, but it can also be adjusted to record what happens inside your car if you need to keep an eye on passenger conduct. It supports SDHC Micro-SD cards up to 32GB in size (available separately here), and cycles recording across multiple AVI video files as you drive. Furthermore the Auto-cycle Recording feature simply replaces the oldest recording once your memory card is full, so you don't have to worry about storage space. keeps a running log of hours and hours of driving, with old files being over-written when the memory card is full. The super wide-angle lens records at a 120° viewing angle for maximum coverage of the road, and includes a built-in microphone, so your dash camera will be your little black box! A must-have for anyone who does a lot of driving, or wants to protect an expensive vehicle with an extra layer of insurance. Please note: This device may be permanently wired to your car only by a licenced auto electrician by physically modifying the power cable included in the kit. Such an installation will void your warranty claim on any modified components. For full warranty coverage, please keep the power cable intact and use your accessories socket (cigarette lighter socket) at all times. Answer: "This is a single camera system. The photo above simply shows the front and back of the unit in the one image." Answer: "Between six and eight hours for 720p @ 30fps video." Answer: "No, the camera does not have an internal battery. It does have a regular mini-USB socket for power input, so could be run off an external power supply such as a power bank. However, we can't know how long this solution would last to facilitate recording overnight." Answer: "The resolution is 720P (1280x720)."